Many corporations are moving their whole infrastructure to virtual systems. This process involves virtualizing centralized components like SAP systems, Oracle database servers, email systems, and fileservers, thus facilitating administration. Additionally, administrators no longer need to shut down systems for maintenance, because the workloads can be migrated on the fly to other virtual hosts. One of the biggest disadvantages of a virtual environment has always been the simplistic network structure. Although physical network switches support VLANs, trunking, QoS, port aggregation, firewalling, and Layer 3 functionality, virtual switches are very simple affairs. VMware provided a solution in cooperation with Cisco, which now offers the virtual Cisco Nexus 1000V switch for VMware environments. The switch integrates with the VMware environment and offers advanced functionality. An open source product of this caliber previously has not been available, but Open vSwitch tackles the problem. Open vSwitch supports Xen, KVM, and VirtualBox, as well as XenServer. The next generation of Citrix will also be moving to Open vSwitch. Open vSwitch , which is based on Stanford University's OpenFlow project , is a new open standard designed to support the management of switches and routers with arbitrary software (see the "OpenFlow" box). These two systems typically work independently on the same device. The data path component only asks the control path component if it doesn't know how and where to route a packet. The control path component then determines the path/route and stores it in the flow table. All other packets in the same flow can then be forwarded quickly by the data path engine. OpenFlow offloads the control path onto a separate controller, which can be a simple server. The OpenFlow switch (data path) and controller then communicate over a secure channel. The OpenFlow switch stores the flow table where the controller saves the individual flows. Each flow describes the properties of the packets that make up the flow and how the switch should handle the packets (drop, sendout port, and so on). Once the switch receives a packet for which it doesn't have a matching entry in the table, it sends the packet to the controller, which analyzes the packet, makes a decision and stores the decision in the flow table. Because of cooperation between multiple manufacturers, the developers have been able to achieve OpenFlow support in several commercial network appliances. Customized firmware exists for several switches by HP, NEC, Toroki, and Pronto . Open vSwitch is a software implementation that provides both functionalities (data path and controller). Before you can benefit from these features, however, you first need to install Open vSwitch. Prebuilt packages exist for Debian Sid (unstable). I have released packages for Fedora/Red Hat that you can download from my own website . You can also install from the source code (see the "Installation" box). If this command fails, you probably need to unload a bridge module: rmmod bridge. In case of other issues, the INSTALL.Linux file provides troubleshooting tips. Although the packages provide start scripts for simple use, you will need to launch manually or create your own start script in case of a manual installation. The configuration database handles switch management (see Listing 1). Distribution scripts for creating bridges will work in the normal way. You can also use ovs vsctl to manage the bridge. In fact, you can use both commands at the same time (Listing 2). If the brctl show command says it can't find some files in the /sys/ directory, the bridge utilities may be too new (e.g., on RHEL 6). In this case, you might want to downgrade to the latest version of RHEL 5. Up to this point, Open vSwitch has acted exactly like a bridge set up using the bridge utilities. Some additional configuration steps are necessary to use the advanced features. All of the settings in the Open vSwitch configuration database can be handled using the ovs vsctl command. Open vSwitch can export the NetFlows within the switch. To allow this to happen, you first need to create a new NetFlow probe. If you previously launched a NetFlow collector (such as Ntop) on port 5000 of a machine with the address of 192.168.0.5, you can now view the file (Figure 1). Figure 1: Ntop showing the flows for the bridge. commands and removed using ovs vsctl destroy …. In many cases, administrators need to restrict the bandwidth of individual virtual guests, particularly when different customers use the same virtual environment. Different guests receive the performance they pay for, based on their Service Level Agreements. Open vSwitch gives administrators a fairly simple option for restricting the maximum transmit performance of individual guests. To test this, you should first measure the normal throughput. The iperf tool is useful for doing so. You can launch iperf as a server on one system and as a client on a virtual guest (Listing 3). You can now restrict the send performance. Note that the command expects you to enter the send performance in kbps. Besides the send performance, you will also need to specify the burst speed, which should be about a tenth of the send performance. The vnet0 interface in this case in this switch port to which the virtual guest is connected. 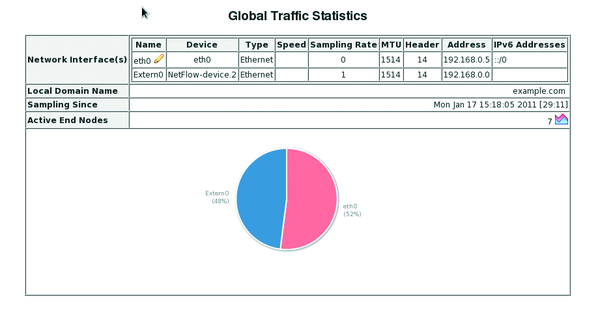 You can test the results directly using iperf. In this case, the restrictions work (Figure 2). Figure 2: Using iperf to check the effectiveness of send performance restrictions. If you are familiar with the tc command and classbased QoS on Linux with various queuing disciplines, you can use this tool in combination with Open vSwitch. The man page provides various examples. adds the mirror port to the bridge. Red Hat's Piranha load balancing software is based on the Linux Virtual Server concept. We show you how to configure and test your setup. The virtualization technology market is currently concentrating on hypervisor-based systems, but hosting providers often use an alternative technology. Container-based solutions such as OpenVZ/Virtuozzo are the most efficient way to go if the guest and host systems are both Linux.